For New England Puritans living before the age of science, everything was a sign of God’s pleasure or displeasure, including extremes of weather. Harsh winters, summer droughts, early frosts that destroyed crops—all could be harbingers of God’s displeasure. Such phenomena could also be seen as evidence of witchcraft. After all, God had created Satan to test man’s faith and the evil one often acted through witches. Take, for example, the case of poor Katherine Grady. In 1654 she was aboard a ship traveling to Virginia. As the vessel reached the coast, a tremendous tempest nearly caused the ship to sink. For some reason her fellow travelers were convinced Katherine was a witch who had created the storm to harm them. The captain agreed and hanged her for witchcraft. Presumably, had she been successful in sinking the ship, she would have used her broom to fly off to safety. Similarly, when Mary Bradbury was accused of witchcraft during the Salem witch hunt, a sailor blamed her for an incident eleven years earlier when his ship was “met with such a violent storm that we lost our main mast and rigging and lost fifteen horses” being transported as cargo. Wolfgang Behringer and Emily Oster have both explored the links between witchcraft and weather in Europe. In Witches and Witch-Hunts, Behringer observed that witches were believed to use their powers to cause thunder and lightning as well as rain, hail, snow, and frost. Outbreaks of witchcraft in Europe tended to coincide with what we now know were the periods of the most extreme weather of the Little Ice Age, conditions that led to crop failure, which all too often resulted in famine and economic distress. Simply put, the more miserable people are, the more likely they are to look for a scapegoat to blame for their problems. 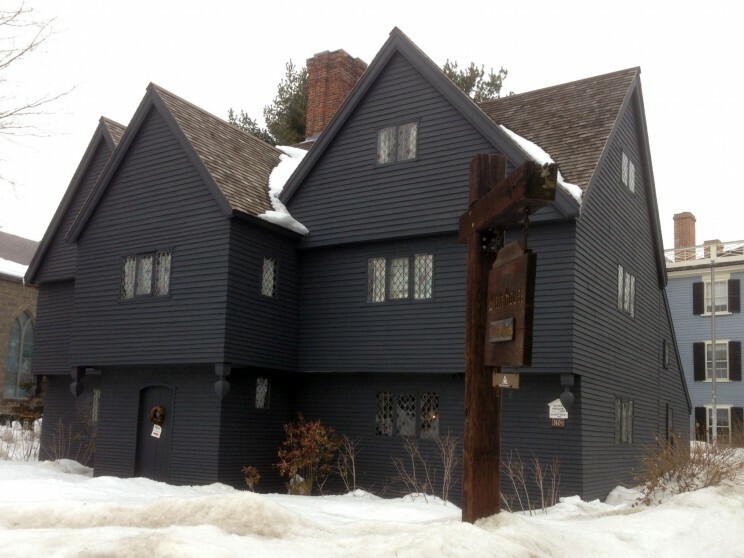 The Witch House, the home of witch trials Judge Jonathan Corwin, endures another severe Salem winter. Photo by Emerson W. Baker. When I looked to see if these patterns held for America, my reward was learning that the Salem witch trials occurred during the absolute worst weather of the entire Little Ice Age. The 1680s and 1690s are now known as the Maunder Minimum, a time of strikingly cold winters and dry summers. The result was not just personal discomfort but increasing crop failures. Starting in the 1680s, many Massachusetts towns that once produced an agricultural surplus no longer did so. Once Massachusetts had exported foodstuffs, but by the 1690s it was a net importer of corn, wheat, and other cereal crops. The parallels between Salem and the witch hunt in the Electorate of Trier, Germany from 1581-1595 seem particularly striking. Both occurred during extremes of weather that resulted in repeated crop failure. Furthermore, while witchcraft traditionally targeted the poor and women, Trier and Salem are notable for the wealthy who were accused–including prominent men. In Trier, Behringer notes that people believed the merchants, who profited by the increased profits from their grain stores, were in league with Satan. People testified the wealthy drove to their black masses in golden coaches. Former lord mayors and numerous parish priests and even higher members of the clergy were accused, including a canon of a cathedral chapter. In Salem, the initial accusations were made against the “usual suspects” but soon spread up the social ladder to include political and spiritual leaders, including Lady Mary Phips, the wife of Governor Sir William Phips. Twenty-nine percent of those accused in Salem were ministers or their relatives, including Reverend George Burroughs, who was executed for witchcraft. In all, five ministers and four ministers’ wives were accused, including Maria Cotton, the daughter of Reverend John Cotton and wife of Increase Mather. Philip English, the wealthiest merchant in Salem. and his wife led the list of the wealthy who were accused. In both Trier and Salem, people took their anger and anxiety out on their leaders. Given the record-breaking winter of 2014-2015, Americans can certainly sympathize with previous generations facing the depths of the Little Ice Age. Our severe winter has seriously harmed businesses, especially restaurants and retail establishments, and municipal budgets have been pushed into the red by blizzards of white. Recurring storms and school snow days have put people on edge, resulting in cabin fever and a notable increase in “snow rage.” And while we no longer scapegoat people with charges of witchcraft, woe be our meteorologists these days. Image credit: Photo courtesy of Emerson “Tad” Baker. 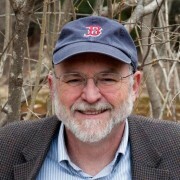 Emerson "Tad" Baker is a professor of History and former dean of the Graduate School at Salem State University. He is the award-winning author of many works on the history and archaeology of early New England, including The Devil of Great Island: Witchcraft and Conflict in Early New England. He has served as an advisor for PBS-TV’s American Experience and Colonial House. His new book is A Storm of Witchcraft: The Salem Trials and the American Experience. Follow him on Twitter at @EmersonWBaker. As a direct descendant of Mary Towne Estey, I have read quite a few books on the subject of Witchcraft in the colonies. 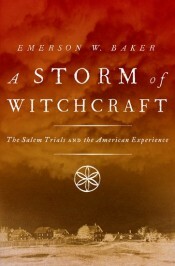 Emerson Baker’s book “A Storm of Witchcraft” is one of the best if not THE BEST I have read. I am grateful for his handling of the subject.